Here’s part 2 of my Watch Connectivity tutorial series. We’ll be looking at using the application context option to transfer data between the Apple Watch and your iPhone. For anyone that needs a refresher on the different options to transfer data with Watch Connectivity, you can refer to my earlier post. In brief, application context is best used for transferring data that always needs to be updated to the latest information. This is important because, for all of the data that you’re transferring over, only the latest copy of that data will actually appear at your final destination. This is useful for things like profile data updates that are always overwritten every time. We’ll be looking at a simple app that shows the last emoji that a user has selected from their watch. See the final projects on GitHub in both Swift and Objective-C.
As always, let’s start by creating our interface first. Model your watch interface after mine. 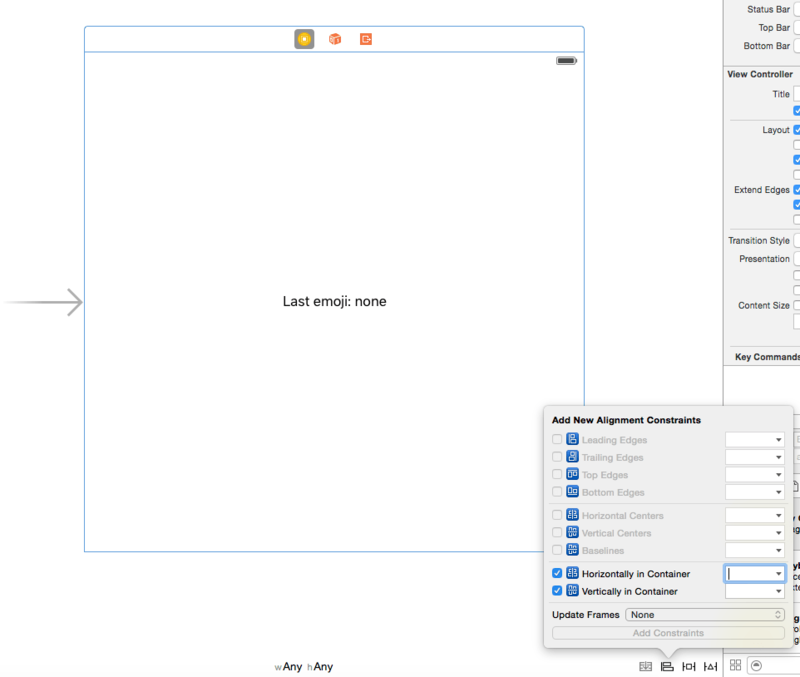 Drag out 3 groups and 6 buttons to create this interface. Feel free to choose any emojis you’d like. For your reference, I chose cat, dog, panda, rabbit, cow and hamster. To get the buttons to always be half the width of the interface, make sure to set the width to “relative to container” at .5 or 50% of the width of the container. You can do this in the sidebar when a button is selected. 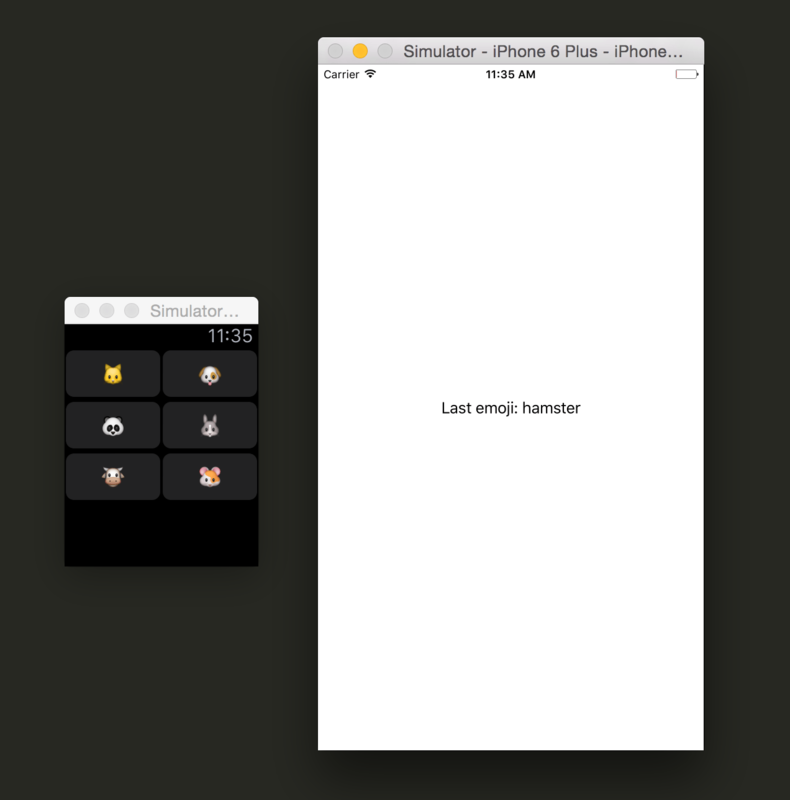 You can close the split view now and just focus on InterfaceController.m/InterfaceController.swift. We haven’t created the sendEmoji function yet, but don’t worry, we’ll get to it. Now, we’re going to get to the part where we start the emoji data transfer. Add the sendEmoji after all of your IBAction functions. Here, we’re creating a dictionary with the emoji that has been pressed and passing it to updateApplicationContext:error. This will send our dictionary over to the phone. Next, we’ll create some basic UI to display the text for the last emoji we pressed on the phone. Drag a UILabel in from the sidebar and center it in the middle of screen. You can do this by checking the center horizontally and vertically in container alignment constraints. It doesn’t really matter what the text here is like since we’ll be replacing it programmatically. @IBOutlet weak var emojiLabel: UILabel! self.emojiLabel.text = "Last emoji: " + emoji! 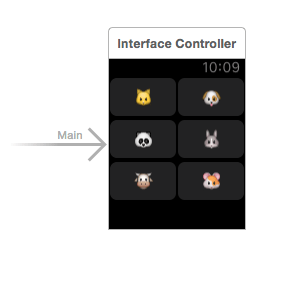 Connect the UILabel from your storyboard to the emojiLabel outlet. Go ahead and close the split view to focus solely on the view controller. Note that we’re setting up our session in this file as we did in the watch extension. The main function you’ll want to take note of is the didReceiveApplicationContext:applicationContext one. Here, we’re receiving the emoji dictionary that we sent over from the watch. It’s pretty simple from here – we just pull the emoji string out of the dictionary and use it to update the text on our phone app UI to display the last emoji name. That’s it! Build and run the app. Click on a few of the watch emoji buttons and keep track of the last one you pressed. That should be the name of the one that shows up in your phone app. Let me know if there are any questions/comments and I’ll follow up as soon as possible. Correct me if I am wrong but I don’t think you should initialize WCSession in willActivate. wiiActivate will get called every time when you raise your wrist. If you look at the Potloc example from Apple they called it in init of the class. I agree. I initialize the WCSession in the ExtensionDelegate’s applicationDidFinishLaunching method. Works like a charm. Hi Kristina, I am very interested in anything to do with iOS especially Apple Watch as I am both learning Swift and Objective C. I have completed your project WatchConnectivity but have a few problems which I am struggling to deal with. I have check all my code which is correct, i have then downloaded your code from Github but still having the same error message. Basically when I add the line import WatchConnectivity, in the ViewController.swift file, I received a error message saying “cannot import module being compiled” This then has a impact with my session. I am using Version 7.0 beta 5 (7A176x). When I command click on the import WatchConnectivity, a box comes up with a large question mark and no information. It code seems fine on the InterfaceController.swift file. Any suggestions? Sorry Michael, haven’t come across your error before and I’m also using the latest version of Xcode. Maybe try restarting? This is a very helpful tutorial; thank you, Kristina! Is there any chance of seeing a tutorial that demonstrates sending more than just one string of data (I.E. the tapped emoji)? What if you download some JSON data via a Weather API; how would that get passed to the watch? Thanks! Alan, it is easy to map JSON data to an NSDictionary, and send it over to the watch via the WatchConnectivity framework. You can use the NSJSONSerializer class to do that. Since the data is coming from a JSON structure, the dictionary will be populated with the object types that can be sent over with WC. just one question is that work this method in background and foreground ? because i will open the 2 device simulator for testing and i need work in background too. Thanks for your kind words! Yes, this will work for both background and foreground. This is awesome. Quick question, I’m getting an error on the line `try session? …’ in `sendEmoji` saying “Use of unresolved identifier session”, any ideas what I messed up there? Thanks! Pingback: WatchConnectivity: Sharing The Latest Data via Application Context | Dinesh Ram Kali. Your posts are super simple and direct to the point. I wish I had found your blogs 6 months back. You have examples for pretty much all the stuff I had to break my head for. I used the code and works perfectly when sending from watch to iPhone but when i do it the other way around, nothing changes on the watch. Hi Christina, I happily had my phone talking to my watch under OS1. Converted to OS2 and I am stuck. I receive the NSDictionary from the Phone, all OK. I set a label.text on the Watch to an incoming parameter. All OK except the UI does not refresh and so the data is not displayed. I saw you were pushing to the main thread, which I have tried, but with no impact. Have you experienced this ?